We are official DJI Singapore Reseller and all our DJI products come with Official DJI Warranty. 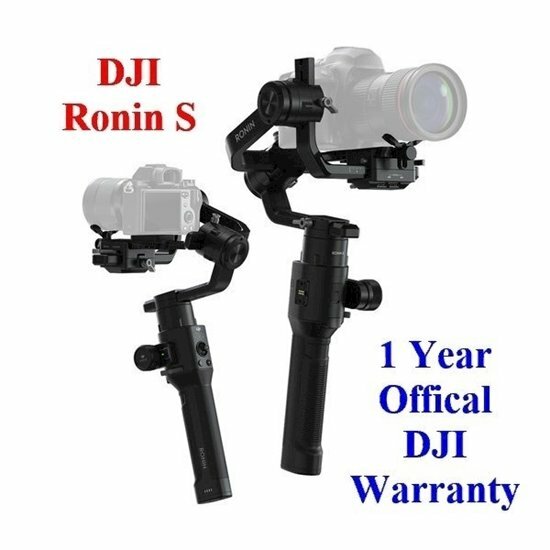 1 Year Official DJI Warranty. The DJI Ronin-S is more than just a miniaturized version of the larger Ronin gimbal stabilizers; it represents a scalable ecosystem for integrating DSLR and mirrorless cameras into professional-grade workflows. The single-handed form factor of the DJI Ronin-S lends itself to lighter camera payloads, up to eight pounds. But don't let its size fool you; the DJI Ronin-S has a lot going on under the hood. Separate modules are available for the handle and accessory docks, allowing you to customize the gimbal based on how you wish to operate it. While using the conventional battery grip, the DJI Ronin-S will last up to 12 hours on a single charge. Between the front trigger, the rear mode button, and the joystick, precise gimbal control lets you obtain the shots you require. The front trigger can lock the gimbal when held, re-center the gimbal when tapped twice, and engage the Selfie mode by turning 180° when tapped three times. Press the mode button to engage three customizable operation profiles, each with tuneable speed and response for different shooting scenarios. If fast-moving subjects are your forte, the Sport mode delivers extra-quick response times and fast gimbal movements, up to a maximum speed of 45 mph. With this operation flexibility, the DJI Ronin-S will fit into documentary, event, and feature film workflows. Everything you need to get started shooting with the DJI Ronin-S comes with the gimbal. A sliding camera mounting plate for attaching your camera and balancing works with the included lens support and riser to secure your mirrorless or DSLR camera of choice. USB Type-C and Type-B cables are included for camera control functions like start/stop and focus pulling (depending on camera compatibility). A 24W USB charger is included for quick-charging the gimbal. The gimbal and all included accessories can be stored inside the included case, which helps protect your equipment during storage and transport.